If you’ve passed the Swarthmore College Entrance Rock in the last couple of months you may have noticed something different. Where there once was a patch of grass hugging the rock, now there is gravel and a few small plants. This may seem strange to some because we have learned to plant in the soil and top-dress with mulch to give plants nutrients and retain moisture. Why would we grow plants in gravel? The goal with gravel culture planting is to create a more sustainable garden requiring less maintenance and less water. This way of planting is being promoted and practiced globally through the ecologically focused “New Perennials” movement in landscape design. One of the leading actors in this movement is Cassian Schmidt, a progressive landscape designer and the director of Hermannshoff Garden in Germany. In the fall of 2016 he taught a workshop at Scott Arboretum to share methods he developed for naturalistic gravel plantings. 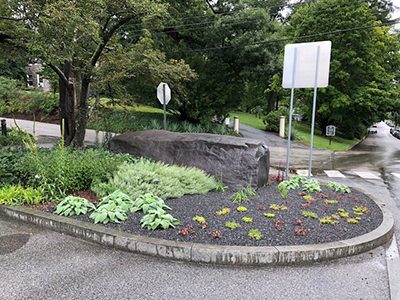 Examples of his methods are in Swarthmore Roundabout, and you can read more about the planting in the Swarthmorean. This planting method is so successful here that we are planting more gravel areas. This technique only partially plants the roots in the gravel. The top 6 inches are pure gravel. Below the gravel is a 4-inch layer of mixed gravel and soil. The key to the planting is making sure the roots are in the soil. For small plants, it’s okay if some of the roots are in the soil/gravel layer. The goal of this kind of gardening is to encourage the plant to send roots into the soil layer. There are many benefits including less watering by the gardeners. The soil retains moisture better when it is below the surface and protected. The gravel allows water to trickle down and stay for longer as opposed to a top layer of mulch where water evaporates quickly. With a thick layer of gravel, wandering weed seeds are less likely to find a home to germinate, so gardeners will have less weeding to do. Inevitably some bold seeds make it but far fewer than those found in a bed of soil and mulch. 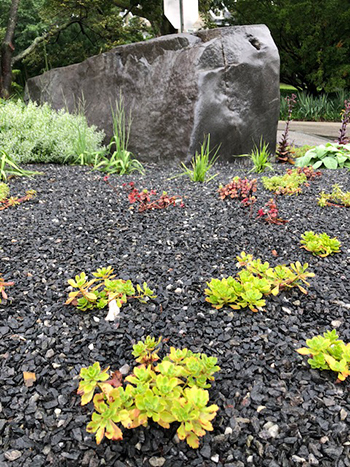 So far in the Swarthmore Entrance Rock bed, the crabgrass has only come up along the edges where there was more soil left behind, and a few bits of pioneering nutsedge have come up in the middle. 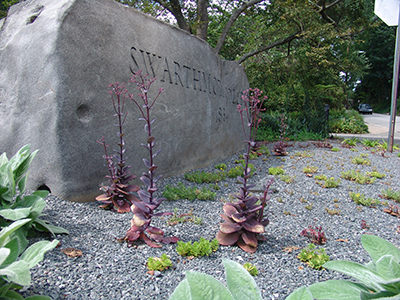 The new Swarthmore Entrance Rock planting is mostly sedums which only needed to be tucked into the first layer of gravel. The deepest digging was for Molinia caerulea ssp. arundinacea ‘Skyracer’ (purple moor grass), Stachys byzantina ‘Helene von Stein’ (lamb’s-ears), and Calamintha nepeta ssp. nepeta (calamint). 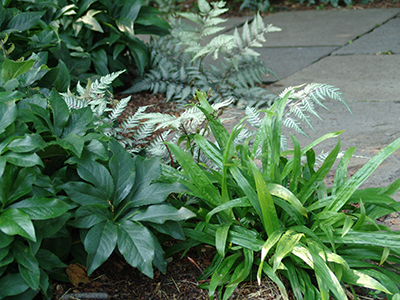 Having already chosen plants for tough conditions, the plants and design changed little when the Collections Committee decided to convert the bed to a gravel garden. Thriving in the shade are Helleborus x ballardiae ‘Coseh 800’ (HGC Snow Dance hellebore) and the Carex plantaginea (plantain-leaved sedge), while the rest have bright sun in an island bed surrounded by asphalt. 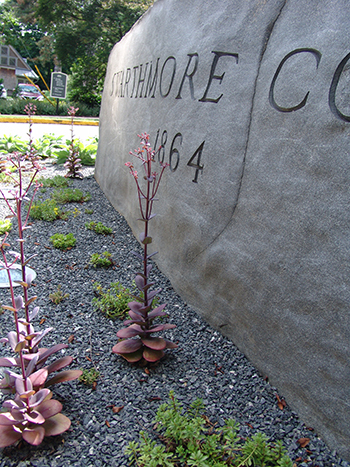 Low growing sedums were chosen for the front of the rock in order not to obstruct the night lighting. The mix of sedums includes Sedum hybridum ‘Immergrünchen’ (little evergreen sedum), S. album (white stonecrop), S. kamtschaticum var. floriferum ‘Weihenstephaner Gold’ (orange stonecrop), and S. spurium ‘Ruby Mantle’ (creeping stonecrop). 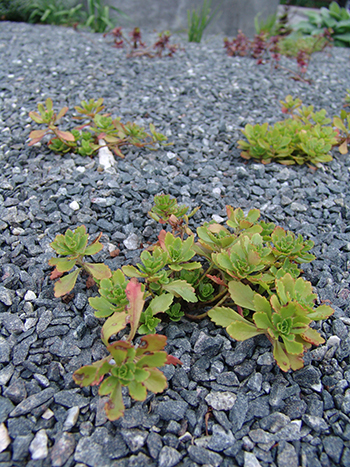 A taller sedum, S. SUNSPARKLER® ‘Blue Pearl’ (stonecrop), is for variation in height and color. Plants like Molinia caerulea ssp. arundinacea ‘Skyracer’, Helleborus x ballardiae ‘Coseh 800’, Stachys byzantina ‘Helene von Stein’, and Calamintha nepeta ssp. nepeta were chosen to compliment the surrounding beds. After regular watering in the first few weeks following installation, the plantings are doing well despite the persistent heat. 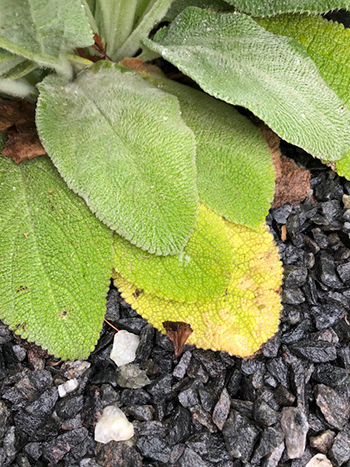 The only issues so far are that the Stachys had its lower leaves burned by the reflection of the sun off the gravel. The leaves were quickly removed to keep them from decomposing on the gravel. Our next venture in gravel gardening will be in the parking lot on Field House Lane. Follow us as we explore the techniques and tips in our Gravel Gardens series. I am very interested in this technique for a public garden here in MD where I volunteer. But I do not see the Swarthmorean link promised? Great information and makes total sense as our summers get hotter and water levels become lower. The idea of planting deeper is a good one. When you say that some of the sedums are “tucked into the first layer of gravel” does that mean they have no soil at all? Would that work for most short sedums? Also, for the rest of the plants you say (in the roundabout article) that the plants are planted low so that the roots grow into the soil. That seems to indicate the top of the roots are about 10 inches below the top surface. Do the stems grow up through the 6” of gravel, plus the 4” of soil-gravel mix? A diagram might be helpful. I want to use this method in one small part of my garden, which is why I’m asking these questions. Thanks for your questions, Linton. The sedums don’t need much. They will start rooting out in gravel or well drained soil easily. 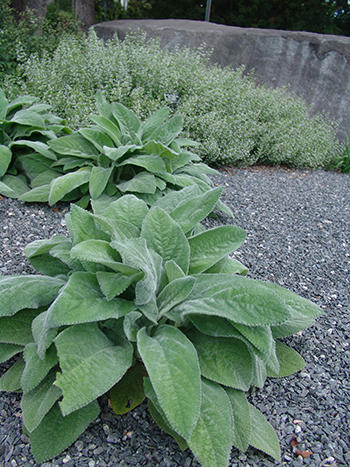 It is possible to cut them up and spread them out on the gravel and they will take root. In the case of the entrance rock, they arrived with roots already so I planted them in the gravel. I can’t say that will work for all sedums because it is a large genus that native to different parts of the world with different growing conditions but I would say that it’s a safe bet with the lower growing ones. 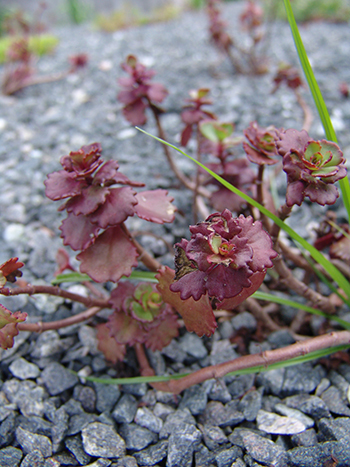 If you’re wanting a specific sedum it is worth looking up it’s growing requirements and habits. The perennials in the roundabout grow up through the gravel and gravel mix or straight gravel. The top of the roots don’t necessarily have to be completely in the soil. They can be in the soil/gravel mix and have the bottom of the roots touching the soil. Please let us know how it works out for you in your garden.